Hey there, on this blog post I wanted to touch base on using Activiti Cloud with Jenkins X. As mentioned in previous blog posts we wanted to make sure that Activiti Cloud provides the right tools for you to build, deploy and scale new Activiti Cloud Applications following standard practices around the technologies required to deploy to public clouds that uses Kubernetes. Sounds too way to complicated to build in-house and at the same time it sounds like a must if you really want to provide Continous Integration and Continuous Deployment (CI/CD) approach in a serious way. Luckily for us Jenkins X provide these and much more. It also validates the approach that we have adopted in Activiti Cloud, where we can build each individual piece in isolation and each of the pieces are designed to behave and operate in a cloud native way and promote and push forward our main objective of providing an industry standard and modern platform to build business applications in a fast an interactive way. In order to test Jenkins X capabilities I’ve migrated our Activiti Cloud Blueprint to a set of individual repositories so we can benefit from Jenkins X conventions. Because I was just starting with Jenkins X I needed to basically create a Kubernetes Cluster and install JX. This is quite an easy procedure if you have access to an AWS account to play with. Jenkins X CLI tools will use Kops to create and setup the cluster and install all the JenkinsX services in a Kubernetes namespace called “jx”. Note: I evaluated the option of using MiniKube, but this is not even recommend in their docs. You can make it work, but it is unrealistic to try to run all jx services plus all your own services locally. If you take a look at JX docs, you will find that they recommend to go with the configurations provided in a Cloud9 workshop which is AWS IDE. I didn’t wanted to go in that direction for now, so I decided to configure the environment to just install JX. export AWS_AVAILABILITY_ZONES="$(aws ec2 describe-availability-zones --query 'AvailabilityZones.ZoneName' --output text | awk -v OFS="," '$1=$1')"
While this is running you can check in your EC2 Section inside AWS Web Console how your cluster is being created and how your nodes are being restarted as part of the set up. Once this is done, congrats your cluster is app and it has Jenkins X inside and you CLI is configure to work with it. At the end of the installation it prints out the password for the admin user. Make sure that you keep copy it and keep it safe somewhere. As mentioned in the introduction the source code of each different service inside our Trending Topics Campaigns BluePrint was now refactored out to individual repositories prefixed by ttc-* inside the http://github.com/Activiti/organization in GitHub. As you might remember (link) we had a global marketing company creating campaigns based on Trending Topics. They need to be quick and react fast on the current trending topics on different social media streams in order to promote their customers’ products. Different departments all over the world might be creating campaigns at the same time not only based on the Twitter feed, other social media feeds can be plugged into the infrastructure, so we need to make sure that our solution scale to support those requirements. The following video shows how you can import these projects into JenkinsX and how to customise the Staging Environment to provide some of the infrastructural service required for the services to interact between each other, such as RabbitMQ and PostgreSQL to store the Campaign’s Process Runtime state. Make sure that the Activiti repository belongs to the member repositories (meaning that it needs to be on the column of the right, by default when you create a new one is not inside the group). I’m quite excited to see how easy is becoming to get an Activiti Cloud Application running in a Cloud Native way on top of Kubernetes which is running in a real AWS and GCE cluster. Even if it is still quite early in the journey we can clearly see all the advantages of having these pipelines set up and managing how the changes are applied into each of our services. 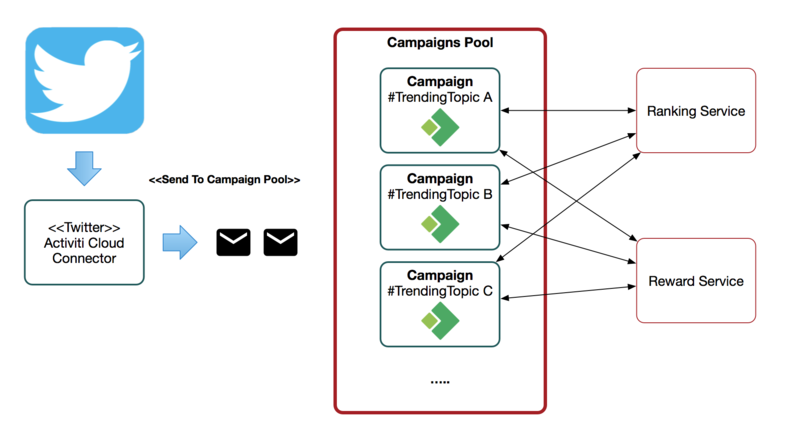 It also make it dead simple to add new campaigns, so we look forward to have this application running in a continuous deployment approach to test our Beta and future releases. If you are interested in these projects and want to participate in our community get in touch, we look forward to improve this BluePrint to exemplify the most common patterns that you will find in real life scenarios, while we keep improving what Activiti Cloud can do to make business automation modern and as easy as possible.